I returned from a week-long trip to find my vegetable garden laden with tomatoes, cucumbers, string beans, green bell peppers, and okra. I brought all the produce inside, dumped it on the kitchen counter and tried to get inspired to clean and prep all of it; I knew once I got started, I’d be in the kitchen for the rest of the day … A journey of a thousand miles begins with a single step. 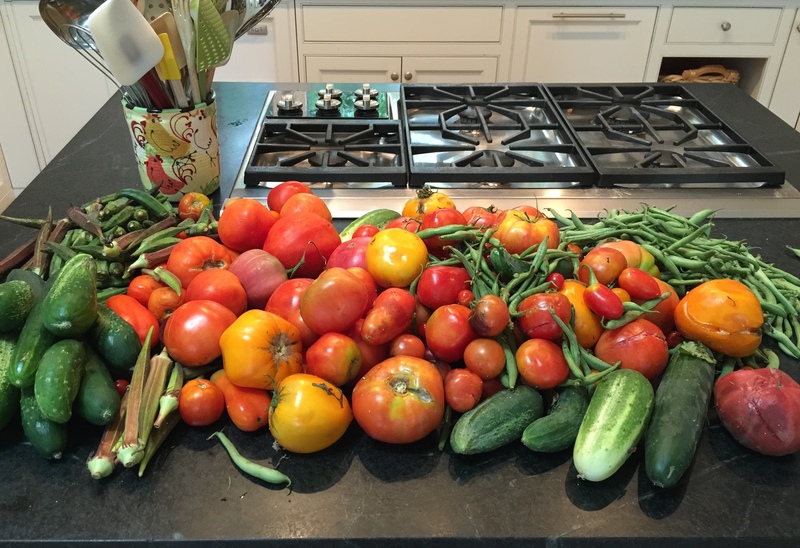 Abundant summer harvests call for big recipes, and I have three go-to’s: ratatouille, gazpacho, and marinara sauce. Since there were no eggplants or zucchini, ratatouille was out. Gazpacho and marinara sauce were in. I made both! My tried and true gazpacho recipe comes from Open-House Cookbook, by Sarah Leah Chase, published in 1987 to instant acclaim. 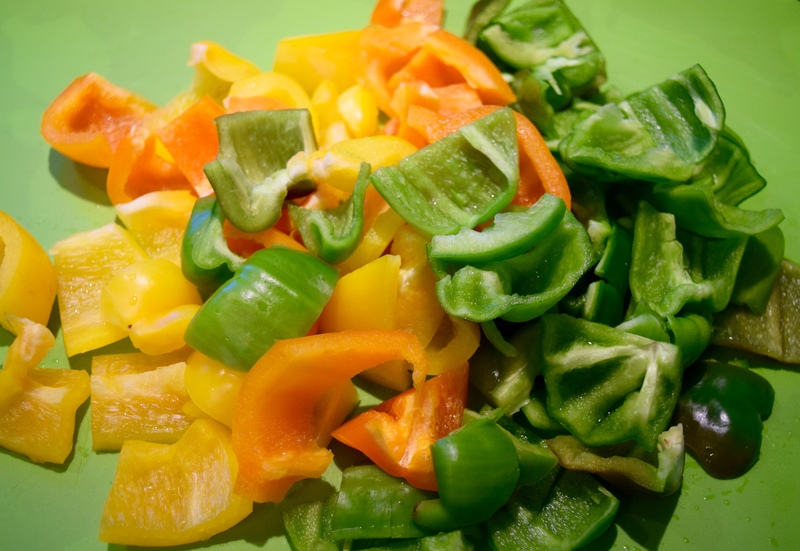 Over the years, I have found my own way to streamline the vegetable prep work, and, thanks to my mother, who also made this recipe and used Bloody Mary mix to spice it up, I use spicy vegetable juice instead of plain. In the instructions that follow, I’m going to show you how to prep each vegetable. 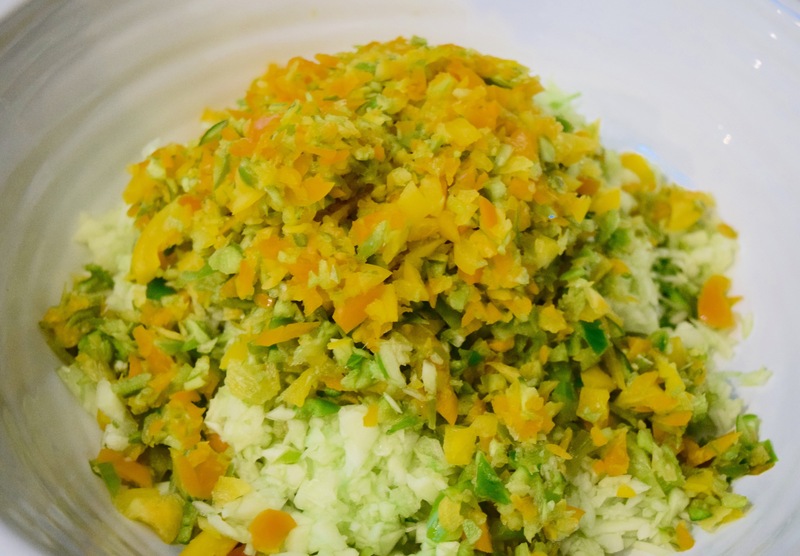 Find a large bowl that will hold 8 quarts of chopped vegetables. 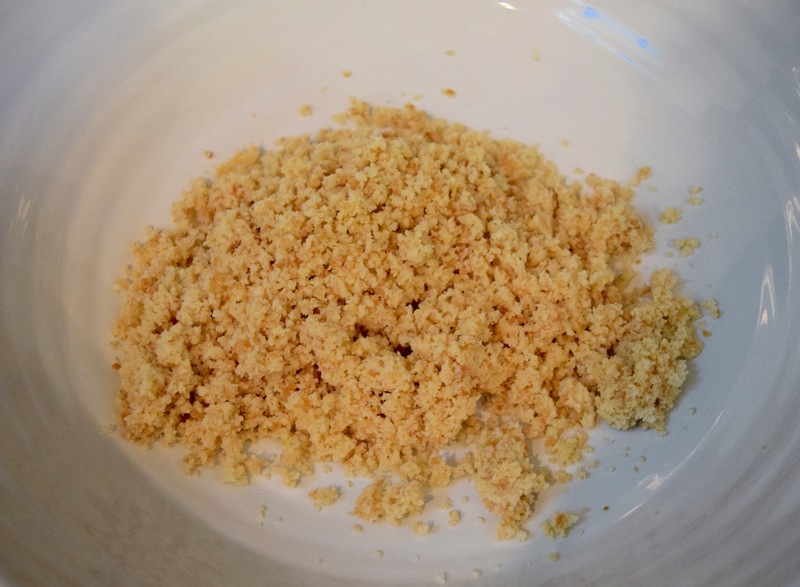 -Make 2 cups of homemade breadcrumbs using the method described in Mom’s Meatloaf. Five or six slices of crusty bread should suffice. -Juice the lemon as shown in the Ricotta and Lemon Cookie recipe. -Peel the garlic cloves. I used three large cloves. 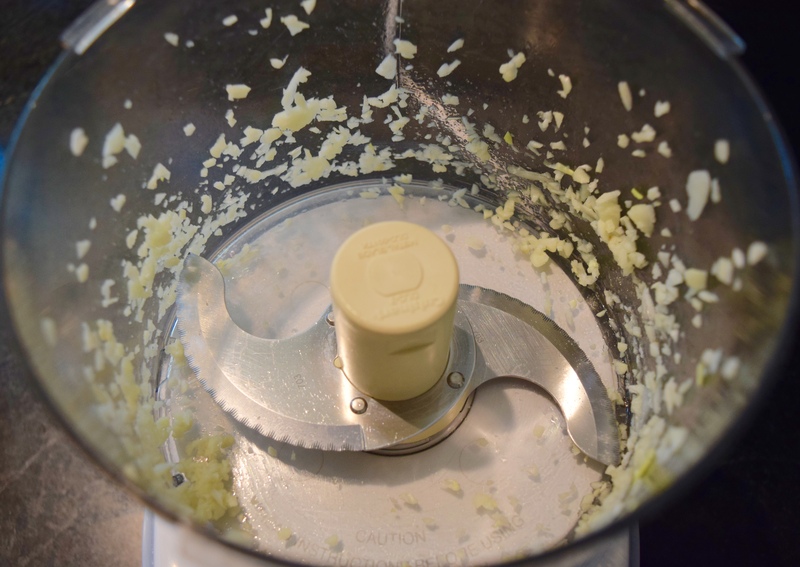 If you are using medium to small cloves, you’ll need all five. Always remember that uncooked garlic can quickly overpower a recipe, so be careful — you can always add more garlic to your recipe later as you adjust your spices. 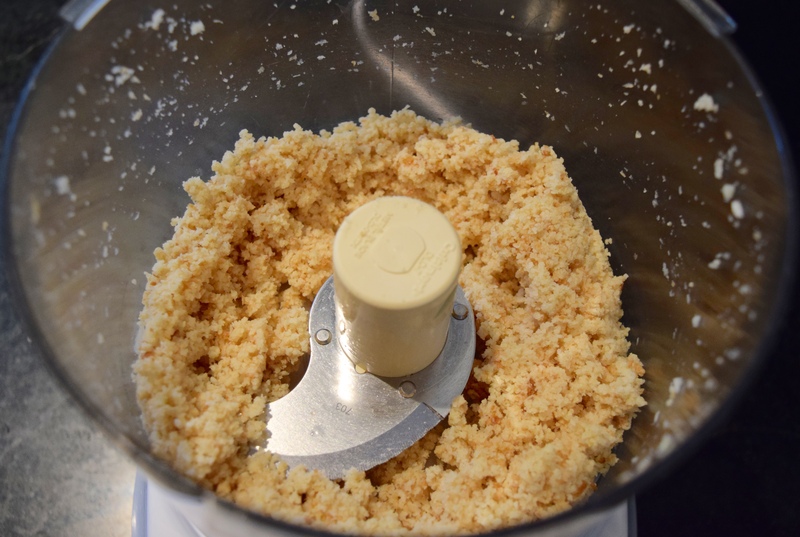 Pulse garlic cloves in food processor until minced, add the breadcrumbs and lemon juice. You want the mixture to become pasty, so process it for about 10 seconds. Wash, cut roots off and trim off the top third of stems. 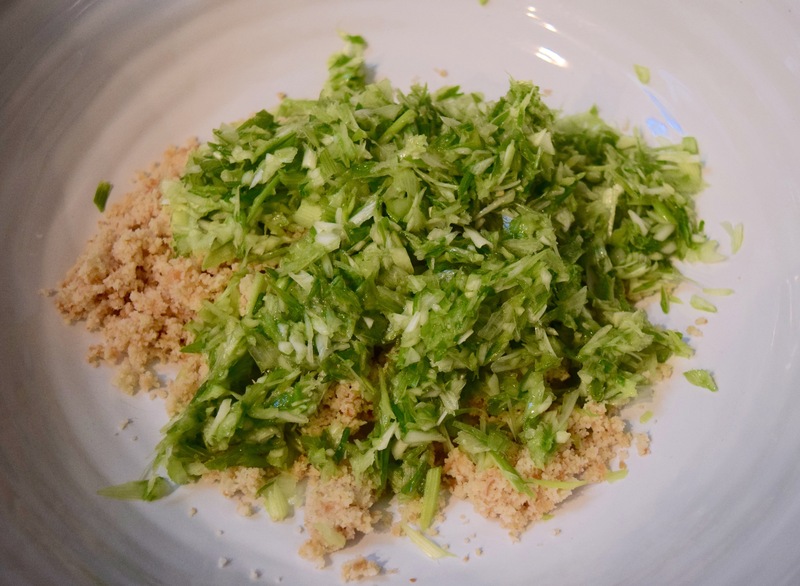 Chop stems into 2-inch segments so they will fit nicely into the food processor bowl. If you put produce in the processing bowl uncut, they won’t chop evenly, and you’ll find yourself practically puréeing food to get everything chopped to a consistent size. 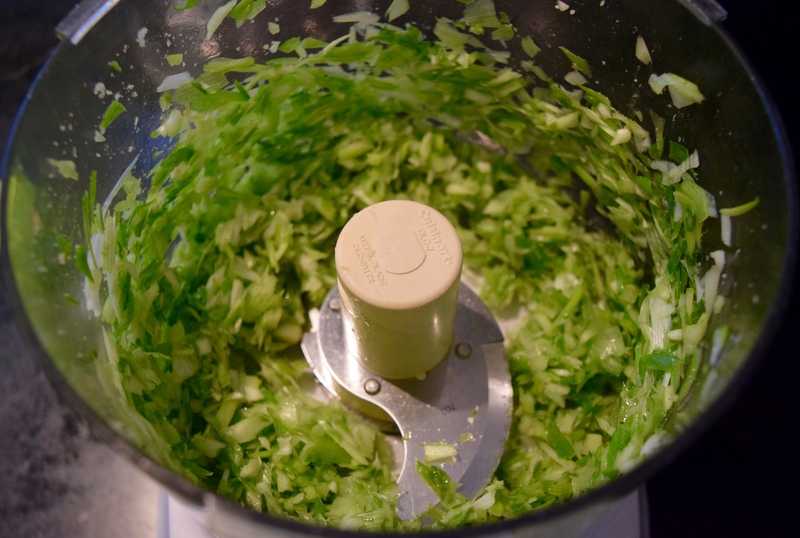 Pulse green onions until they look like the photo below and then add to your large container. Cut off ends and peel. Cut into long quarters. 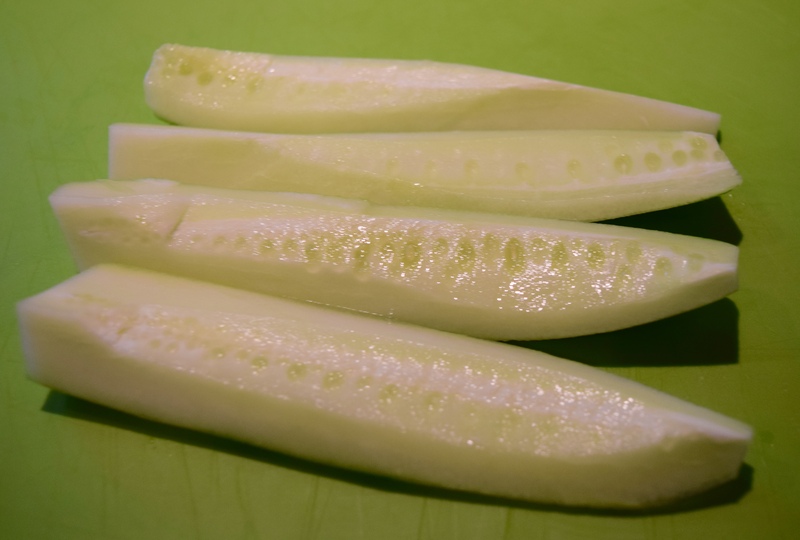 I always taste a homegrown cucumber before adding it to a recipe because sometimes, if the cucumber went through a dry spell while growing, it can taste bitter. If the cucumber tastes at all bitter, throw it in the compost. Remove seeds by quartering and using a paring knife to remove the “triangle” tip of seeds from each strip. 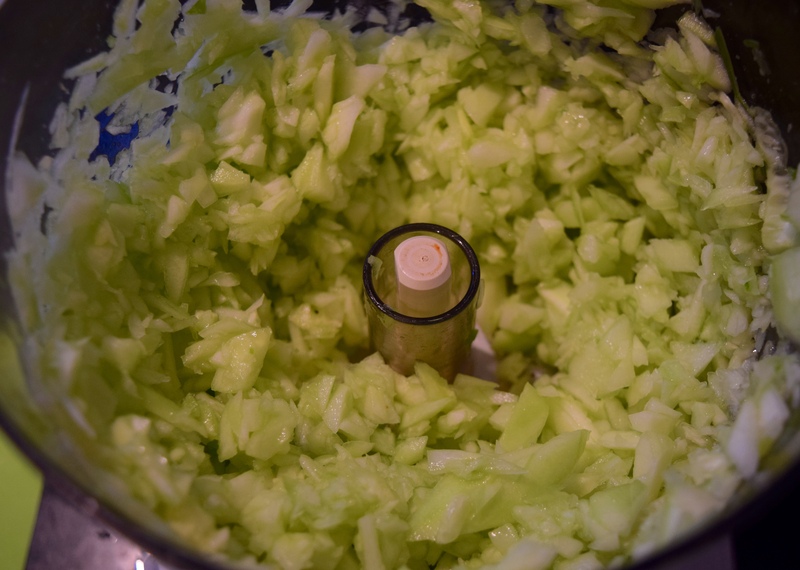 Chop into 2-inch chunks before processing. Once processed, add to large container. I had a lot of small green peppers in my garden and used them, plus two colorful peppers I bought at the grocery store. 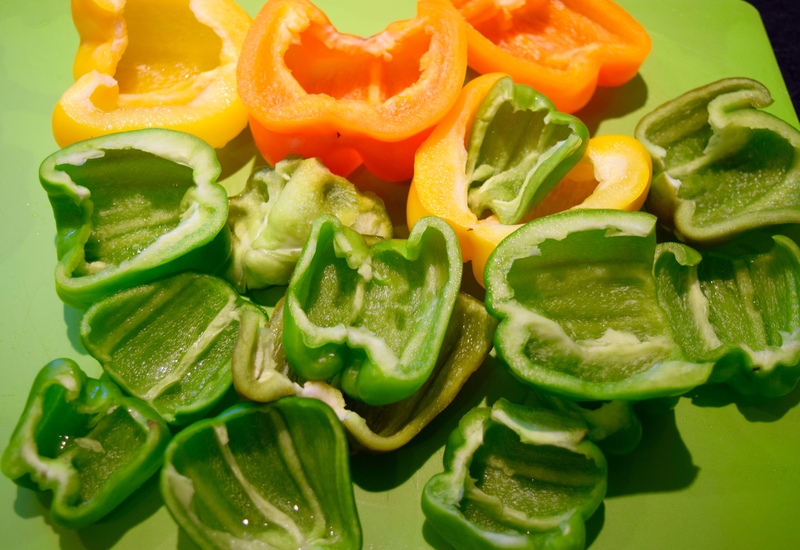 To prep peppers: cut in half vertically, and remove core, seeds, and extra white pith. 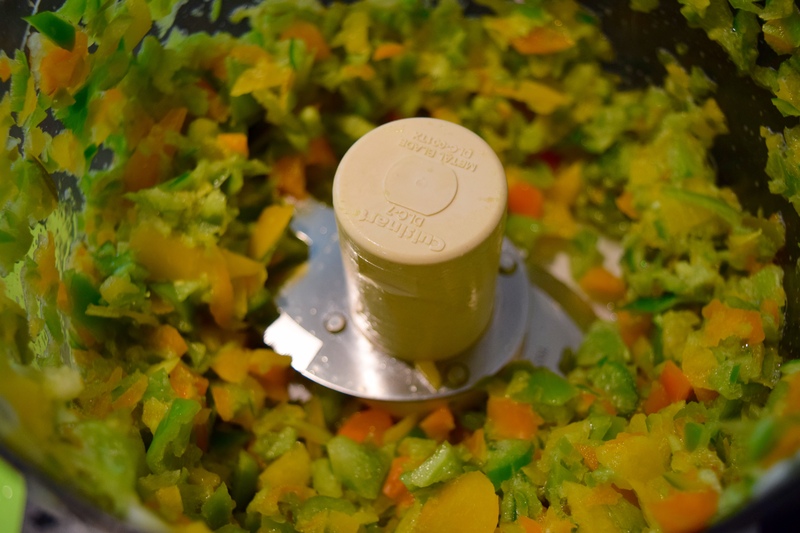 Chop into 2-inch chunks for even processing in the food processor. Add to the large container. 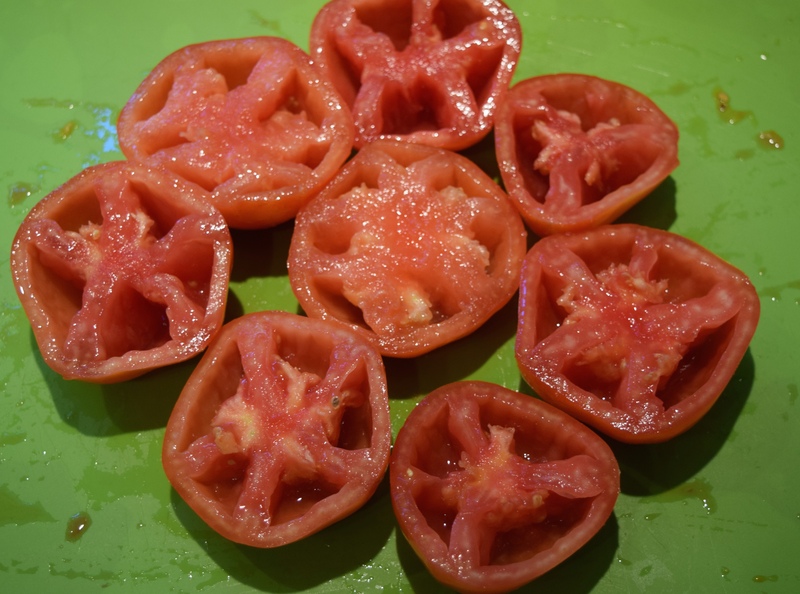 Over the years, I have learned there is no reason to peel the skin off tomatoes. I do, however, remove the seeds. This is easily accomplished by cutting the tomato in half horizontally and using your finger to scoop the seeds out. Add the spicy vegetable juice, the vinegar, olive oil, salt, and pepper. Adjust seasoning. Much later that day, after making marinara sauce and blanched string beans in vinaigrette, the kitchen was clean. All that remained was a pile of cucumbers that were going to be made into cold cucumber soup, but I ran out of steam, and my family had lost interest in cleaning up after me. Oh, and the okra, it went into the latest version of my “everything, but the kitchen sink” Shepherd’s Pie. I really do enjoy reading your blog! can’t wait to try this gazpacho, although I will have to find a lot of people with whom to share! Thank you, Mary Leyden! 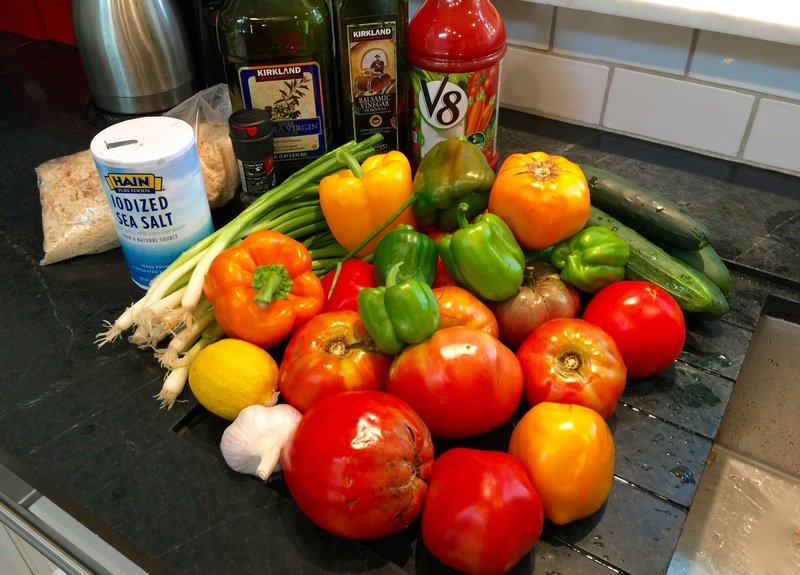 It does makes a ton of gazpacho! The good news is we were eating it for 8 days and the flavor was still good. I gave a few quarts out to friends who needed a little treat, too! Glad you are enjoying the blog. The step-by-step instructions are written with my boys in mind — that’s why every aspect of preparation is explained! This is beautiful and l know it was delicious! Thanks, Mary Helen! See you soon! I can’t wait to try this recipe! I love the addition of the bread crumb mixture and the spicy tomato juice. Mine was always a little bland, and I am thinking this will give it the extra uuumph mine has been missing–thank you! Liz, I so agree with you! 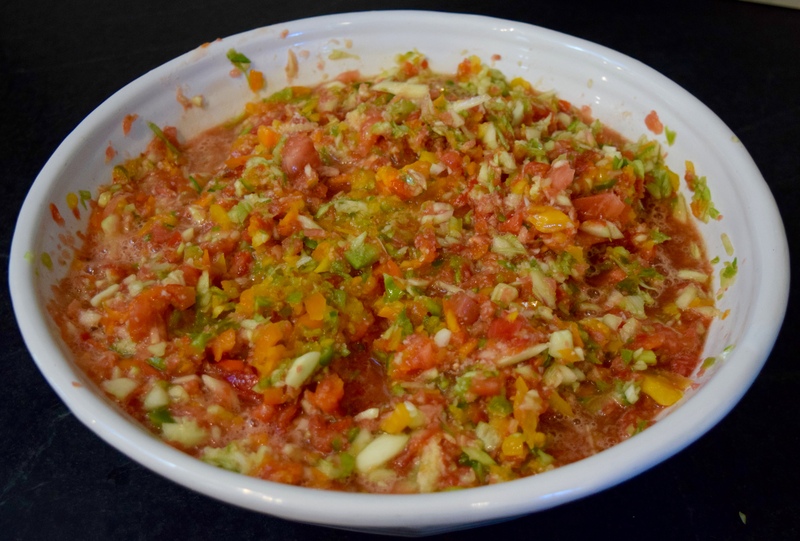 Once I made this gazpacho, I never tried another recipe. It’s so full-bodied. Yum! Delicious! 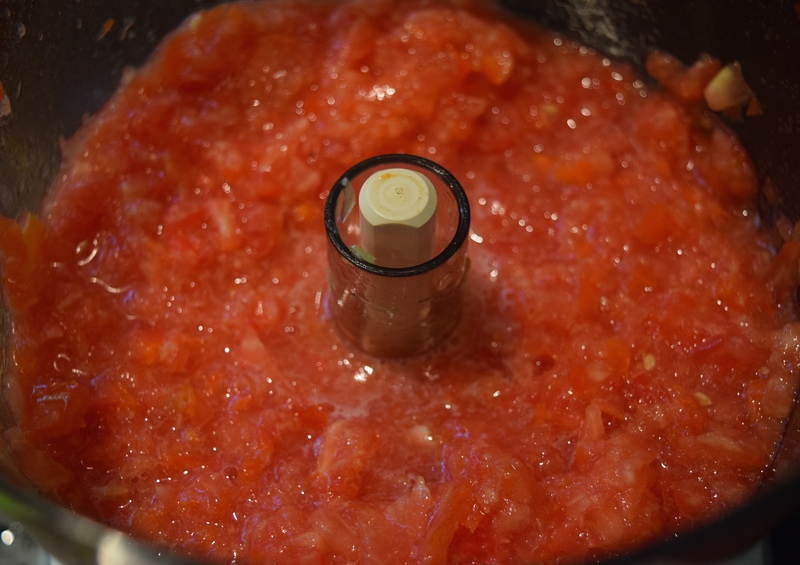 I was about to post my own gazpacho recipe at Turning Toward the Sun, but you beat me to it!